In our previous post for the series ‘reward for non-reward professionals’ we looked at the fundamental concept of reward – what does it mean to employees and what should it mean for employers? As the series progresses we’ll continue to focus in greater detail on different forms of reward, what they are and how they can be used effectively. In this post, we’re going to take a look at the value of recognising your employees and what’s involved in establishing a formal ‘Employee Recognition Scheme’. In our previous post, we discussed the concept of ‘reward’ and how it means so much more than just remuneration. In the hierarchy of ‘reward’, experience has shown that recognition is a highly valued commodity in the workplace. If an employee feels like they are a valued member of the team, it’s high likely that they’ll feel more motivated. Of course, there’s a lot that goes into creating an environment where people feel that their contribution is valued and appreciated, and nothing can replace genuine, authentic recognition from one’s leaders and peers. What we’ve found however, is that not all people leaders are naturally good at recognising the work of their teams – so we create programs and processes (‘Employee Recognition Schemes’) to help ensure it happens. What are the key considerations when designing an Employee Recognition Scheme? Step one – you need a clear philosophy with realistic, meaningful objectives. The idea of spending your time drafting a philosophy statement might seem a bit wishy washy, but, if done well, it can become a statement you regularly refer back to when testing/designing ideas to make sure your reward programs stay on point. Philosophy Statement: Take a moment to self-reflect. Your organisation’s philosophy statement should support your broader reward strategy and help explain the specific objectives of the scheme. Organisational Culture: How do you want your staff members to behave and interact when they are at work? Ensure your organisation’s culture is clear and defined in a way that people can relate to it. Employer Brand: The way you recognise employees should be an overall reflection of the organisation’s value proposition e.g. What’s our competitive edge and how can we recognise it in the workplace? The Organisation’s Workforce Management Strategy: Consider how your Recognition Scheme encourages job satisfaction and motivates employees to contribute their best work. How do you clarify what’s worthy of recognition in the workplace? When implementing a formal Employee Recognition Scheme, it’s crucial to decide exactly what type of behaviours, outcomes or results you want to recognise. Who is responsible for the actual ‘act’ of recognition? How will you budget for any associated rewards or awards? How can you tailor what the recognition process looks like for each staff member? Remember, some people like the limelight and others shy away from it! How is recognition and the use of your scheme going to be tracked and measured? For example, can we use technology to support our Recognition Schemes? A key challenge for many of our clients has been to distinguish between the ways in which they’ll reward performance outcomes (achieving targets etc) versus the ways in which they recognise and reward behavioural performance (the ways people go about their work). For us, an employee recognition scheme is best suited to behaviours, whilst other forms of formal incentives can work better when recognising performance. What’s the potential impact of a well-designed Employee Recognition Scheme? By making it clear to your employees what behaviours are truly valued in the workplace, you help establish the ‘rules of the game’ that you want people to live by. Experience has shown that effective recognition of the desired behaviours can directly impact overall engagement levels, leading to; lower staff turnover, uplift in overall job satisfaction and improvements in organisational culture. Research suggests that organisations with strategic recognition schemes are 48% more inclined to report high engagement, whilst 68% of organisations who implement well-designed Recognition Schemes report improvements in staff retention rates. However, on the flip side, 31% of employees leave a job due to a LACK of recognition from management. Although it’s important for an employee to feel recognised by their superiors in the workplace, don’t underestimate the importance of recognition between colleagues – 41% of companies with peer-to-peer recognition report an improvement in customer satisfaction. The way people treat one another in the workplace can be infectious. 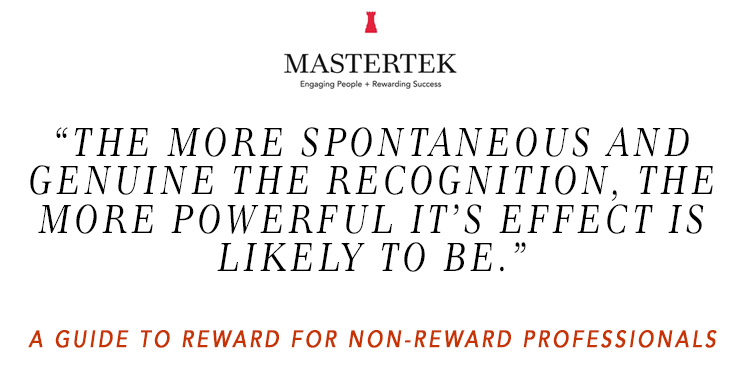 Whatever rewards or awards might be attached to the recognition scheme, we can’t stress enough the importance of ensuring that the act of recognition must remain a ‘human process’. The more spontaneous and genuine the recognition, the more powerful it’s effect is likely to be. Automated processes are great for managing the admin, but must not replace human contact when it comes to the crunch. Why is communication key to success? Once you’ve taken the time to design your Recognition Scheme, it’s time to launch it. Time and time again we’ve seen that the success of Employee Recognition Schemes can hinge on how well they are communicated and promoted. After the Recognition Scheme is launched – don’t neglect it. A Recognition Scheme should not be set and forget. Make sure it’s reviewed, and measured. Your Recognition Scheme will be approached and in different ways by different staff members, therefore it is important that you provide ongoing guidance to ensure consistency across the board. Referring back to the philosophy statement of the scheme and always tying conversations back to the objective can help you achieve this.